The Fabulous Kissing Technique Shows You How To Create Delicate Patterns And Build 3 Dimensional Images By Cutting & Layering In Your Rubber Stamping. The Kissing Technique allows you to "Dare to Be Fabulous" because you can be in charge of which patterns appear in specific places in your design. You no longer have to search for an elusive patterned stamp, you simply purchase plain stamps that have the potential for patterning and "kiss" them on any of your Background or other patterned stamps. This technique is fun too because there is always that little bit of mystery as to how it will turn out. I planned on using black, white and grey for this card, and was surprised to find that my black ink turned purple when I printed it up. So.... my card is black, grey, purple and white. I think the black ink is finally running out of pigment after 2 and a half years of constant use, so I had better get that re-inker out to boost the colour a bit. It is a simple looking card, but it actually took quite a while to complete. 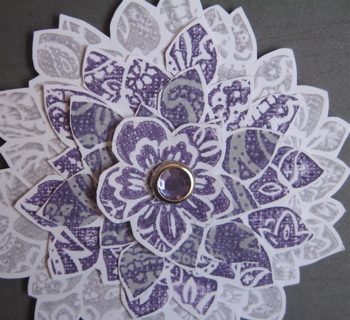 The cutting of the flower petals was quite confusing to some of my fellow stampers, but eventually everyone was pleased with their results. Inks - Basic Black, Going Grey. Card stock - Basic Black, Basic Grey, Elegant Eggplant, Whisper White. 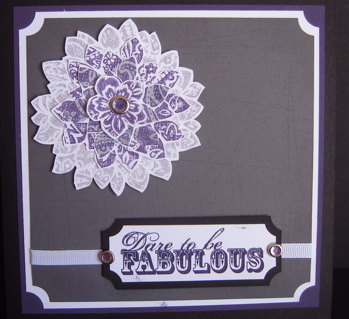 Stamp Sets: Fabulous Flowers, Floral and Sanded Background stamps. Accessories: Rhinestone Brads (round Ice), Dimensionals, Paper Snips, Slit Punch, White Grosgrain ribbon. The detail photo shows you how you can achieve many effects by using either one or 2 colours in the Kissing Technique. I have used grey on white card, black (purple) on white card, and grey and black an white card to achieve the various results. You can achieve many different results depending on your combinations of colour and pattern, and again this is only limited by your imagination. You should never think that you have to just ink up a stamp and leave it at that. Experiment and have fun, you will be surprised at what you can achieve. You can see another example of the Kissing Technique here where you can view different colour combinations and stamp sets. If you would like further information on this technique please feel free to contact me. I can order any of the products for this technique for you, and will include a free tutorial with your order. Check out our on-line catalogue for lots of other great stamp sets and accessories.